Miss Slingerland graduated with honors from the University of Illinois-Champaign in the spring of 2015 with a BS in Elementary Education, concentrating in Mathematics. While at the U of I, she considered the St. John’s Catholic Newman Center to be her “Rome away from home.” There, she was very involved in participating and leading Koinonia retreats and starting up a Focus Bible study for her fellow sorority sisters. She comes from an active volunteering family who are also parishioners at The Church of St. Mary’s in Lake Forest. Miss Slingerland has spent numerous summers volunteering at Camp Hope, a summer camp for young adults with developmental disabilities. She enjoys playing sports and games of any kind with her family and friends. 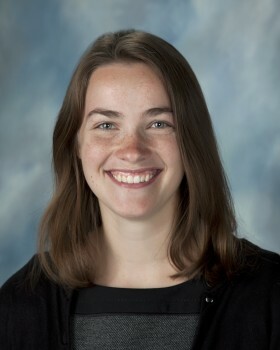 She also played Volleyball and Lacrosse for 4 years at Lake Forest High School and earned her Girl Scout Gold Award by teaching high school students how to better interact with their friends while playing sports. She lives in Lake Forest with her parents, 15-year-old sister, and a 150lb Mastiff puppy.